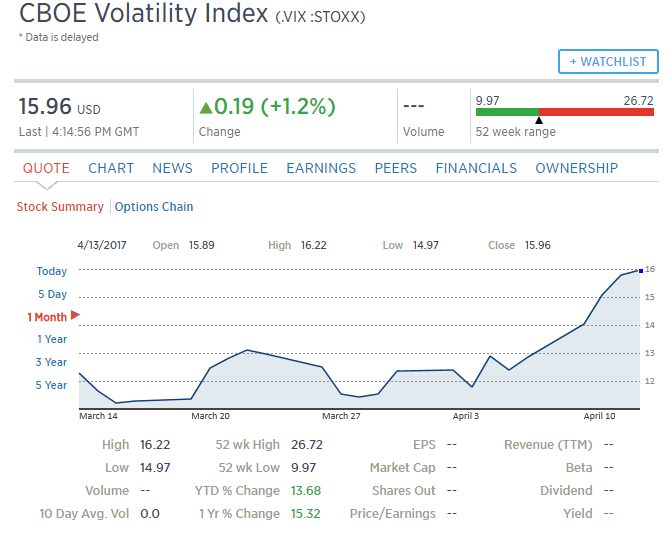 Volatility is at a 2017 high, as geopolitical uncertainty over Syria, and an array of issues, led VIX to increase nearly ten percent over the last two days to nearly 16. VIX had tallied more than 104 sessions below 15, which was its longest streak since February 2007. That’s over now. The Chicago Board Options Exchange (CBOE) Volatility Index, commonly referred to as ‘VIX’, measures the “implied volatility” of the S&P500. The “fear gauge”, as VIX is also called, is said to predict stock market volatility in the near term, though some question its reliability. Mainstream media reported last week that U.S. stocks and VIX stayed quiet despite a “week of surprises.” That ended early this week. Global uncertainty over numerous geopolitical and economic tensions likely led to the increase. The big picture overall is that volatility seems to be returning, not only in the U.S., but in Europe, as well. The Trump administration has been unclear over its intentions in Syria and the vector of further U.S. incursions weigh on investor minds. 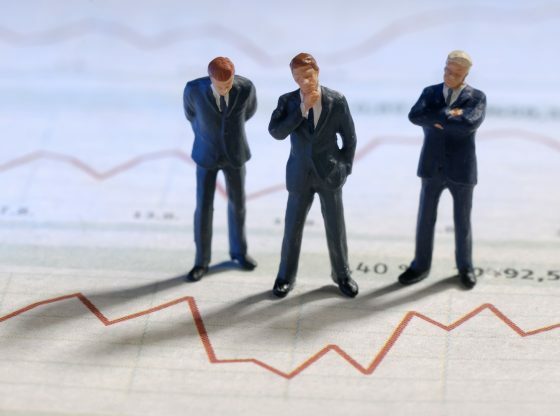 The gold price increased nearly twenty dollars on Tuesday, feeding the storyline that psychological uncertainty could lead to real world market volatility – and soon. The missile attack on a Syrian Air Force base, which the U.S. contended used chemical weapons on civilians, had led to a short-term increase in the gold price. Early this week, gold has demonstrated gains. Statements from Secretary of State Rex Tillerson were met with hostile responses from the Kremlin in Russia, and the Chinese recently stated that the U.S. has wasted trillions on warfare, instead of development. The U.S. missile strike in Syria, moreover, caused controversy among the public on multiple continents, and the U.N called for calm between nations. Trump’s stance on an array of issues remain unclear. In particular, investors are unsure over a potential regulatory overhaul by Trump. White House economic adviser Gary Cohn on Friday separated Wall Street’s investments and retail banking operations could be in the plans to boost lending by lessening regulatory burdens. The U.S. jobs report was nearly the weakest in a year. European markets held their breath on a generally calm day Tuesday thanks to gains in the luxury goods sector, as a slumping financial sector has unnerved the continent in recent sessions. Geopolitical uncertainty in Europe centers on the upcoming French presidential election, and could weigh on U.S. markets. “The U.S. options market is finally starting to care about the French elections,” said Pravit Chintawongvanich, head derivatives strategist at Macro Risk Advisors in New York, who recommended positioning with iPath S&P 500 VIX Short-Term Futures ETN options. What the spike in VIX means is uncertain, although the stock market has traded lower today. VIX hit an intraday high of $15.88 today – which is its highest value since November 11. Today’s price increase means VIX has extended its week-to-date gain to 17.6% while the S&P 500 Index (SPX) has fallen 0.3% over a similar frame of time. Schaeffer’s Senior V.P. of Research Todd Salamone noted in this week’s Monday Morning Outlook that “a potential signpost that equities could be in for a corrective-type move would be a daily VIX close above 15, or multiple closes above the post-election closing high of 14.04.” VIX has not closed over 15 since Nov. 8. 14 has represented VIX’s ceiling since the presidential election. 11.25 has been the floor. VIX has touched 11.25 five times in intraday action since late December. VIX highs have been colored by the fact that the fund has seen unusually high options volume. Stock traders bought 59,770 put options on the Volatility Index – a 206% increase compared to daily volume of 19, 523 put options. For the best deals in bullion, check out CompareGoldPrices.